Movin’ on down the Blue Sky line I’ve realized that there are some Blue Sky Natural Sodas that I like and some that I don’t. 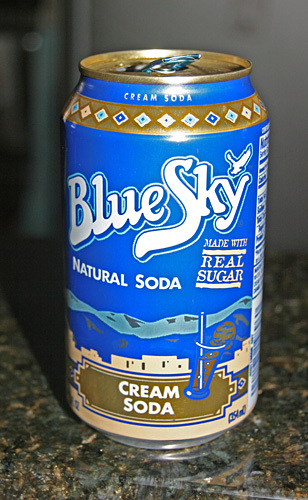 For the most part Blue Sky Organic ones tend are good, just the regular Blue Sky Natural sodas, but the Blue Sky Free sodas or the diet sodas are down right awful, there barely is any flavor — in my opinion. So I’ve been sticking with the Blue Sky Natural sodas and this one I tried was okay. In general I am not a huge fan of Cream Soda, but Blue Sky’s version was pretty good. Which one would you prefer? Both have the right amount of carbonation and flavor, it’s just that one of them is waaaaay better for your body. Plus, I’m the kind of girl that can’t have caffeine, that’s another reason why I keep trying different Blue Sky Products, there is NO CAFFEINE. And that’s awesome. You can find Blue Sky Products in your local grocery store, and that good thing is that they sell these cans individually so you can try one before you commit to the whole pack. Each can will run you about $.60. “real sugar” is beet sugar, probably GMO.